New Delhi: Media company STAR India Pvt. 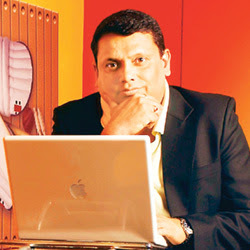 Ltd named Uday Shankar as its chief executive officer (CEO). Shankar, who was named STAR India’s chief operating officer in May, will assume his new role immediately, according to STAR, which is a wholly-owned subsidiary of News Corp.
Shankar will be responsible for STAR’s overall business in India and will report to Hong Kong-based STAR group CEO Paul Aiello, who had been serving as STAR India CEO as well. Uday’s promotion is a recognition of the important contributions he has made to the growth and strategic development of STAR India since he joined the company,” Aiello said. In a related move, STAR India named Jadgish Kumar as chief operating officer. Kumar is currently senior vice-president (finance) and is based in Hong Kong. He will report to Shankar and work closely with him in optimizing operational efficiencies and driving the company’s growth agenda, a statement said. Prior to joining STAR India, Shankar served as CEO of Media Content and Communications Services, a 74:26 joint venture between Ananda Bazar Patrika Group and STAR Group for more than three years. Before that, Shankar was the editor and news director at TV Today, launching channels Aaj Tak and Headlines Today. He was also responsible for launching the news division of Sahara TV.